LOVE "Choice" Grade Oranges 35 lbs. Unlike our Pearson Ranch Gift brand oranges that strive for perfection on the outside, our new LOVE® Choice brand oranges are a little less than that, but ONLY on the outside. Some have blemishes from wind or the sun. Others are oddly shaped or can have a rough skin. But what you will find on the inside, are oranges just as sweet, juicy and delicious as our Gift and Love Premium brand, but at a great lower price! So if you are willing to give LOVE a chance...the rewards can be quite fruitful. The Food and Drug Administration has concluded that diets low in saturated fat and cholesterol may reduce the risk of heart disease. Citrus fruit (like oranges) and their juices are fat- and cholesterol-free and citrus fruit like California Oranges and grapefruit are high in fiber. The FDA also has concluded that low fat diets high in fruits and vegetables containing fiber, including soluble fiber, may reduce the at risk of heart disease. What's in a Box of LOVE Choice? 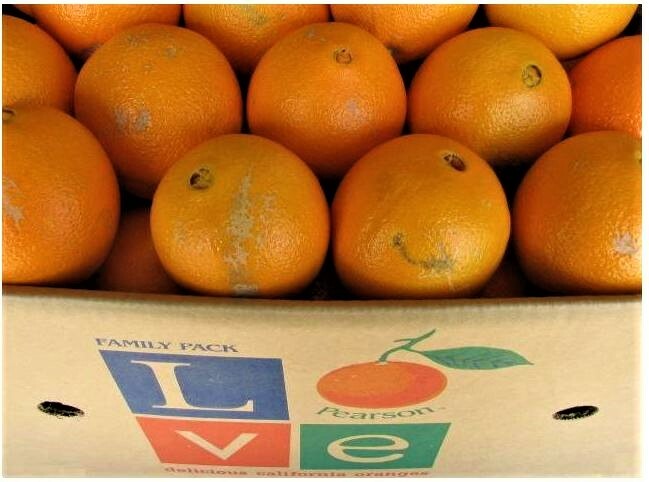 Each 35 pound box of LOVE Choice Oranges, contain only fresh, deliciously sweet tasting, oranges of different sizes, some with varying "character marks". Grown in the California sun, raised with caring hands and irrigated with deep underground well water, our oranges are easily backed by our 100% Pearson Ranch Satisfaction Guarantee! *A few words about shipping* Pearson Ranch can ship fresh citrus ANYWHERE in the U.S., Including: Texas, Louisiana and Arizona! Also... you only pay for the shipping you actually need! We don't insult our customers by CLAIMING to offer "free shipping", then stick the cost into the price of the fruit! Please COMPARE "other" on-line fresh fruit vendors and see if what you pay for is what you're really getting! **Also please note...occasionally extreme weather conditions (cold or hot), holidays and/or weekends, require us to determine the best possible day to ship your fresh fruit order. If we have to change the shipping date of your order, we will notify you via e-mail as soon as possible. This is the best way to help ensure the fruit you receive (or send) will be the freshest possible!